Non-US International Medical Graduates are medical students who are citizens of countries outside of the US and attended medical schools outside of the US. An example of this is someone who attends medical school in their home country and decides to pursue residency training in the US. 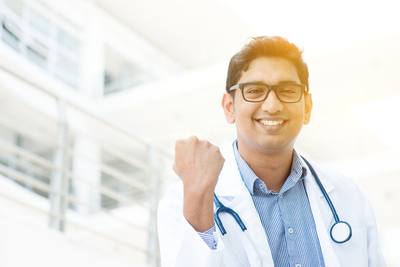 If you are planning on obtaining a US medical residency position and are not a US citizen, or do not have a Green Card, Permanent Residency, or an Employment Authorization Document (EAD), you will need to learn about your visa options. There are two main visas non-US International Medical Graduates (IMGs) can access in order to train in the US. Visas are a large residency application factor for Non-US International Medical Graduates (IMGs). Non-US IMGs are responsible for researching individual medical residency programs they intend to apply to for the program’s visa policies. Researching residency programs and their visa policies properly will help Non-US IMGs conserve their resources and increase their chances of finding the right residency program. But, you do not have to go it alone. Match A Resident’s Customized Lists have individualized visa filters to help Non-US IMGs find residency programs, no matter your visa needs. The path to success for Non-US International Medical Graduates (Non-US IMGs) may have more twists and turns than a US medical graduate (USMG), but there are tricks Non-US IMGs can incorporate into their residency application efforts to make a greater impact on their chances. Educate yourself. The residency application process comes with endless procedures and time sensitive activities. The more you learn about the overall residency process, the easier your journey will be and the less chance you have of missing something crucial. Start early. Applications may not open until early September, but do not underestimate how long it takes to gather all of the ERAS Application components. There are transcripts, documents, writing and program research to accomplish. Start in May or June to give yourself enough time. An incomplete or rushed application does not look good to Program Directors. Get US Clinical Experience (USCE). USCE is defined as hands on work with patients in a US medical environment. Typically this takes the form of Externships, Clerkship, and any clinical rotations you complete in the US. USCE can get you US-based Letters of Recommendation, and many programs require USCE. It is an incredible boost to your ERAS Application. Research Programs Carefully and apply broadly. NRMP data supports that successful IMG candidates apply to, interview in and rank 2-3 medical specialties. Pick your specialties realistically and research each program meticulously. Each program has a unique set of requirements and you do not want to waste your time and money on incompatible program selections.